Climate Common Sense: Hind-casting Accuracy - 74% of Warming Man-made! 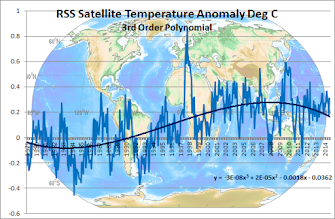 With the astonishing number of variables that can affect global temperatures these researchers whipped up some models that gave the calculated temperature rise as .55 degrees very close to the target figure of .5. Of course people more cynical than I might say that they had the answer before they created the models and the models might possibly have been adjusted if the result was way off base. 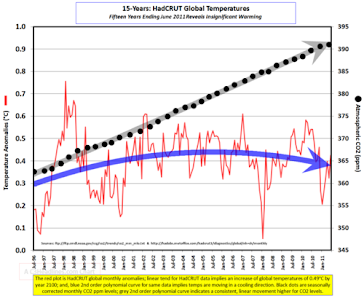 The lack of warming in the last 15 years is not discussed and we do not know how the models coped with this fact or whether it was ignored the way other climate "scientists" have ignored it. Of course those same cynical people might also question whether SciAm would have published independent research that said the majority of warming was natural. Since 1950, the average global surface air temperature has increased by more than 0.5 degree Celsius. To separate human and natural causes of warming, the researchers analyzed changes in the balance of heat energy entering and leaving Earth—a new "attribution" method for understanding the physical causes of climate change. The unenlightened reader might attribute 62.5% of this article to global warming propaganda and 37.5% to the amount of grant money available for any research involving the words "climate change". However I guess climate scientists should stick to hind-casting as they are terrible at forecasting. Why is it that after reading that (un)Scientific American article, I get the distinct feeling that the 'researchers' started out with a clear expectation of what they'd find, then set out to 'prove' it? I see that pattern again and again on the AGW alarmists' side of the fence. Science is all about using the most impartial and stringent logic possible to discover the fundamental facts about a hypothesis, whatever those facts might be. Without fear or favour. The IPCC and other Climate Alarmists have thrown science out the window in their grab for big funding and 'prestige'. I really hope we're turning a corner and that the misled public might be starting to wake up, but I don't think it will happen. The Germans didn't wake up to the truth of the shrill repetitive propaganda Goebbels & Co were feeding them until they lost the war.